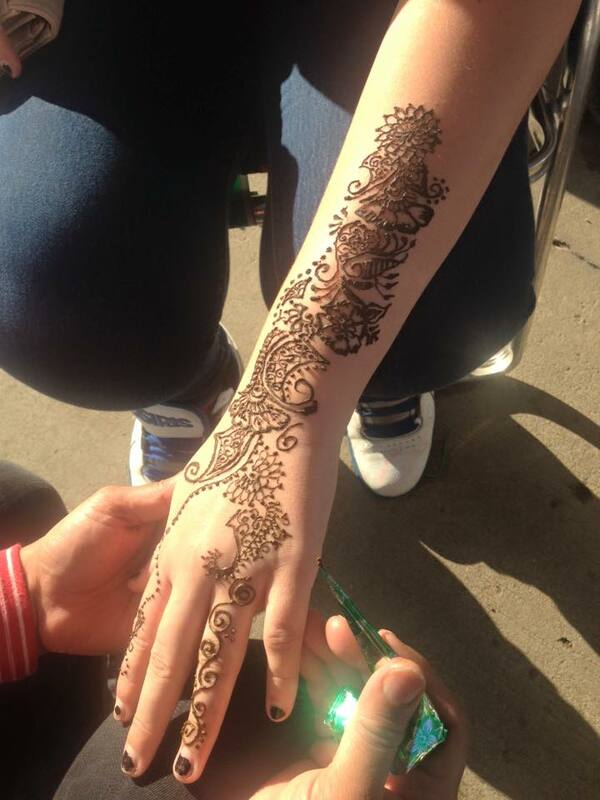 Maza Foods provides Henna services! Come down to our Farmers Markets for a beautiful design at an affordable rate, or give us a call if you would like to arrange a private appointment, in which we will come to you* or you will come to us, whichever is preferred. 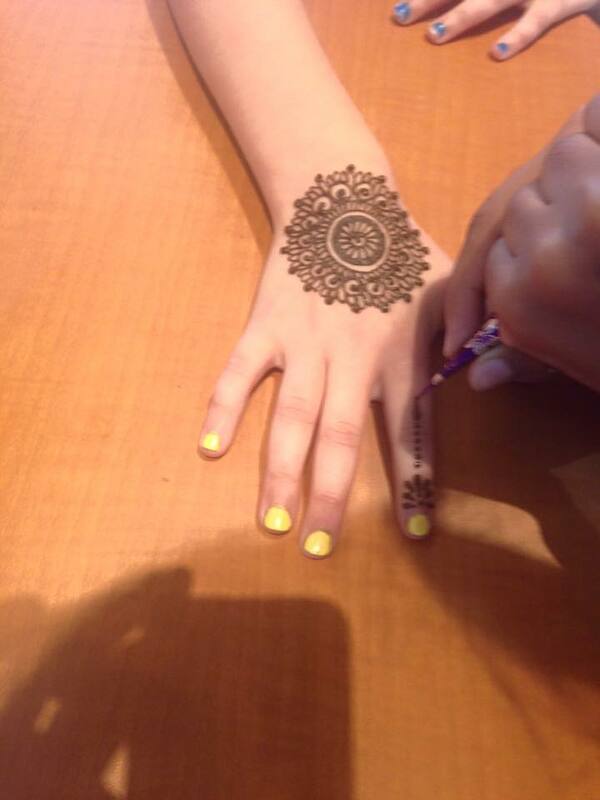 Prices for Henna go up by five; a simple, small design is $5.00, a more detailed, larger design is $10.00, and an intricate, extremely detailed pattern on the hand and part of the wrist is $15.00. *If this is the case, please be aware that we charge an extra $3.00. Henna is a Pakistani tradition, and is an essential part of Pakistani culture. The powdered leaves of a tropical shrub are made into a paste and applied to the body in the form of art. Henna is typically applied before weddings, Eid (An Islamic festival that marks the end of the holy month of Ramadan), and other special events. It enhances a persons beauty with its intricate patterns. In hot countries such as Pakistan and India, some people prefer to submerge their hands and feet in henna because it has a cooling effect. No. 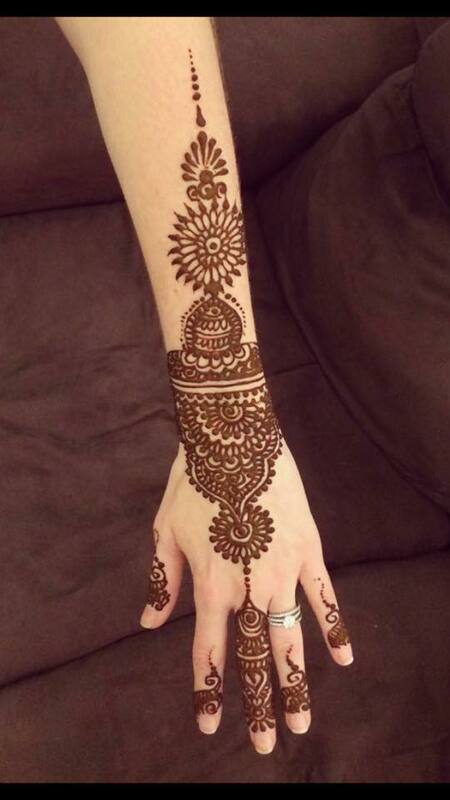 Henna is a temporary 'tattoo' that lasts for one week to ten days. Results may vary according to skin tone and skin type. Please be aware that excess water contact (swimming, taking an extensive amount of showers) do cause it to fade more quickly. Absolutely not! Since Henna is temporary, it is applied with a cone. In fact, some find the application process rather relaxing. Does Henna have harmful effects on my skin? No. Henna is plant-derived, made with tea tree oil, lemon juice and other natural ingredients. We urge you to steer clear of 'Black Henna' though, although it may seem more appealing because of its darker color, it contains chemicals that can react with your skin causing allergic reactions, rashes and other harmful effects. Maza Foods strictly uses all-natural Henna to ensure customer health and safety.